Let’s Farm is a fun, fast, friendly and free to play farming MMO that lets players work together with other players in the community to build up their own farm ranches. The game itself can be accessed through your own web browser, either through your PC or a tablet, and whilst many of the elements are based on casual gameplay there is enough content to keep players interested four hours at a time. The graphics and sounds are colourful and exciting and the gameplay is simple enough for younger gamers with in-depth tutorials and guiding systems to help you navigate the interface and different features. 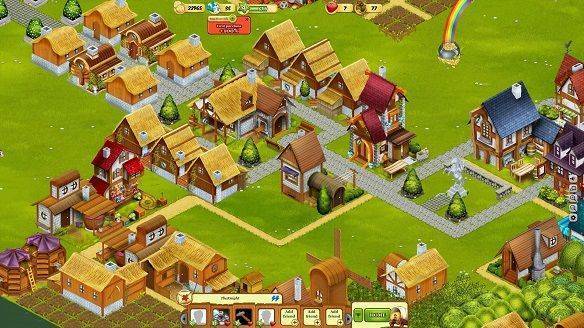 The main purpose of the game is to build up your own unique farm where each building, field and decorative structure is constructed and hand placed by the player. With a number of quests and tasks to perform, handed out by friendly AI characters, players will earn XP and currency rewards to help their farm flourish. Players must actively monitor their resources in order to use them on the farm or take them to market and sell them or trade them with other players. With a number of plants, vegetables, fruits and even animals that players can grow or breed on their farm there is always something new to try out. Both structures that are built on the farm and the produce that different buildings and feels can make it takes a certain amount of time to produce them, as well as the seeds if growing a specific fruit, flower or crop. The time it takes can range from a few seconds, a few minutes to even a few hours of real-world time and so players have the choice of either playing more casually and returning to the game at a later time once their items are ready to gather or using up their earned premium Diamond currency (a currency that can be purchased using real-world money). In doing so the timer on a buildings construction or a produces growth will instantly expire and be completed so the player does not have to wait around. Players can earn extra rewards by completing daily tasks and challenges, often as not that will ask players to either build a specific structure for on their farm or grow a certain type of produce, usually harder to acquire items that will take a longer amount of time to grow. If successful players will yield lots of rewards but they can equally paid premium currency to simply complete the daily task and earned their rewards without actually completing them. A few times a day players are able to visit other farms and help them out, giving little bonuses as well as gaining a bonus for themselves, which demonstrates the social aspect of the game. As well as this there is a global chat channel that players can talk to each other in, to help each other out, meet new friends and share their achievements to the community.